Our buildings have been constructed from natural rock with thatched roofs creating a pleasant atmosphere - cool in summer and warm in winter. We have 12 rooms including one executive suite and one wheelchair friendly room. Total capacity at Woodlands Lodge is 12 single or 24 sharing. 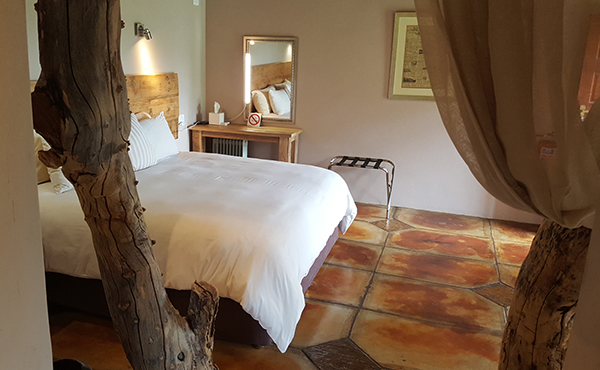 Total capacity with the Bush Lodge is 22 single rooms or 44 sharing. All rooms are en-suite, and are four star graded. Being only a 35-minute / 29 km drive North East of Pretoria and 50 minutes from O.R. Tambo Airport or Sandton, it’s the perfect getaway for any occasion. Please note that the minimum number of people that we will accept a booking for, will be a group of 8 guests/delegates unless otherwise advertised. Contains a spa bath, indoor & outdoor shower facility, private deck etc.